(Newser) – Beth Holloway confronted the only suspect in her daughter's death after sneaking into the Peruvian prison where he is being held. Holloway told Joran Van Der Sloot she had "no hate in her soul" for him during the brief confrontation, MSNBC reports. Holloway had no permission to enter the prison, and she and the Dutch TV journalist she entered the prison with were soon taken away by guards. Van Der Sloot—who extorted $25,000 from the Holloway family by offering to reveal the location of their daughter's body—refused to answer direct questions about Natalee Holloway and handed her mother his lawyer's business card. The Dutchman's lawyer says Dutch media is working on a TV special featuring Beth Holloway and the family of the young Peruvian girl Van Der Sloot is accused of murdering. 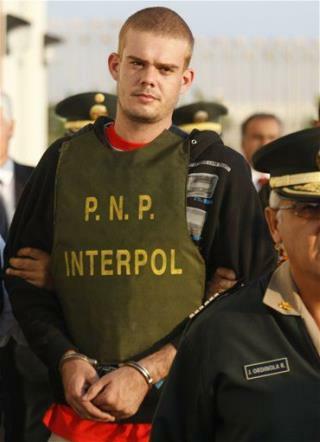 Click here for more on the Van Der Sloot case. @Joe - How is it Holloway's fault that this other girl got killed? I think the fact that she wants to closure to find her daughter's body and find the truth isn't going to to hurt anyone. She has no hate for Urine van der Poop, then why is she sneaking into some Prison in Peru just to tell him that? If it makes Beth Holloway feel better to confront Van der Sloot, she should. It was her daughter, and it's her life. The problem with hounding sociopaths past insanity is they derive pleasure from it. It makes them stronger. The truly questionable issue is; why, after due process, why do we keep sociopaths alive in prison?